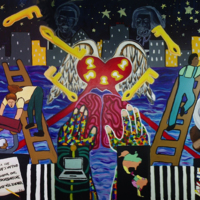 Location contains "Rochester, New York "
Picturing Our Dreams is by incarcerated youth at the Monroe Correctional Facility in Rochester, New York. The mural was created in collaboration with a New York State Library Centre writer, visual artist and Rochester School District teachers. The ideology behind the mural was that inmates could communicate the idea that there is freedom and knowledge inside the jail system. 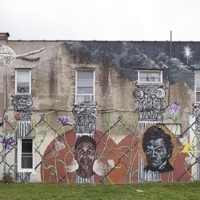 In the centre of the mural, a heart with many key-holes floats around the corresponding keys, and above are the faces of the abolitionists Harriet Tubman and Frederick Douglass, as well as Barack Obama and Dr. Martin Luther King Jr. 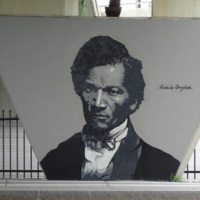 In 2008, muralist K. Fitch painted a mural of Frederick Douglass in the abolitionist's former home town of Rochester, New York. 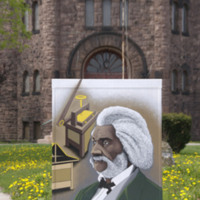 The mural depicts Douglass in the later years of his life. It had been destoyed by 2014.